The following is an email response from a friend, whom I asked for some particulars about flying a P-40, needed for a script I was editing. Sadly, I had never flown a P-40, but Jim Appleby certainly had, along with maybe 101 other types in his pile of logbooks. You can come up with some of the damndest questions! When I was younger, my brain was a lot swifter, but in some 40+ years it doesn't respond very well. So, we'll go from what's left of the memory! For gear retraction, turn on the electric hydraulic pump located in the baggage compartment area aft, which built up your gear pressure. During WW2 it used a mixture of castor oil and alcohol. Once pressure is built, reach to the left, pull the yellow gear-retraction handle out of the detent and raise to full-up limit. After this you lightly touch the brakes to stop wheel rotation as the snubbers in the wheel well generally don't work too well, and tires eat the hell out of the canvas covers located in the top. The pump is very inadequate for the job! So to get the gear up, you usually assist with the emergency hand pump located on the right-hand side of the pilot seat, bolted to the top of the wing. 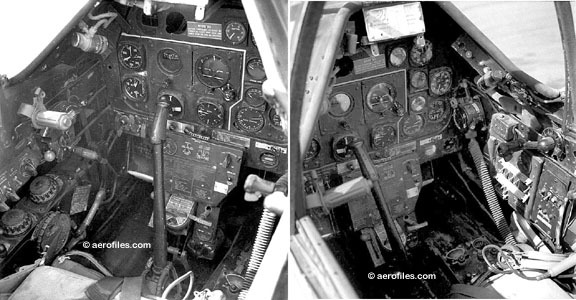 Some 40s had gear indicators on the panel, others had two quarter-inch dowels that protruded through the top skin of the wing and slowly disappeared into the wing as the gear came up. If you're in a late model with a retractable tail wheel, you have no way of knowing whether it's up or down without an indicator. The only sure way of knowing the position of the tail wheel is on landingif you hear an unusual grinding sound and are trailing smoke and bits of tail wheel doors, etc, you can then assume it's not in the correct position. Once the gear is up, which can take a few days, you return the gear handle to the neutral detent position, which holds the gear up hydraulically, because there are no up-locks. You can double-check the gear-down position by pushing the gear handle beyond the down position and checking the down-lock position. You also have a gear warning horn, if you can hear it over a controller screaming that your gear is not down! This system varies from the early models to the later ones, but is always very slow on retraction. Not only does the strut fold up, but it swivels 90° to align the wheel flush to the chord of the wing, flat! Fuel is by way of a manual transfer detent located on the fuel selector handle placard. It is not pressure feed nor does it have an electrical pumpthe engine-driven pump or the booster pump physically picks up gas out of the tank and feeds it to the engine. You can salvo the belly tankI don't remember whether this was manual or electrical, but I do recall in post-war civil models, the FAA enforced safety-wiring the drop release where it physically could not be salvoed from the aircraft in flight. In stretching fuel mileage, the theory is 1600 rpm, 36" manifold pressure, and manually leaning the mixture to give you about 170 mph in cruise (in days before the knot was invented). This is sort of a contradiction. You save a hell of a lot of fuel, but you really don't go anywhere. Whereas with normal cruise power you could be buzzing along at 200, more or less. Of course, if you have a 100-mph tailwind, the first method would be quite acceptable. Gun energizer switches are hung on a lower sub-panel just above your shins, with your gun sight control, etc. Once activated, the guns are fired from the pistol grip on the stick. (I don't remember being able to select the number of guns activated or the means of doing so.) Incidentally, of interest, your mike radio button is located in the center of the throttle ball, and the cowl flaps have a manual control that looks like the parking brake from a 1928 Packard. Wing flaps are hydraulic and very effective. A P-40 light on fuel, like all good fighters, should always be three-pointed. I've seen 50-55 mph over the threshold with full flaps to be fairly common and very stable. It's really a friendly bird. One thing about flying the E, which was shorter, I believe 18" was that in a terminal velocity divethe plane was redlined at 507 mph! I never had the balls to try it because I always ran out of rudder at about 400, then had to use aileron to keep things going straight. By then you were thoroughly convinced that the next maneuver would be a series of slow rolls to the left. Discretion being the better part of valor, you simply pulled the throttle and stick back slowly and reduced your airspeed. I would suggest after all this baloney you seek out or locate via the Internet the AN-P40-1 Tech Order, the pilot's operating handbook. That'll tell you all the stuff I forgot.